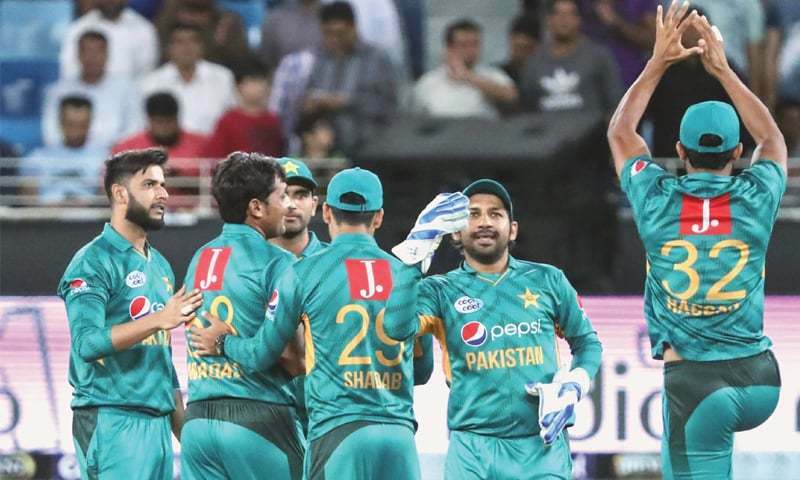 DUBAI: Babar Azam became the quickest batsman to reach 1,000 Twenty20 runs as Pakistan whitewashed New Zealand 3-0 with a comfortable 47-run win in the third and final match in Dubai on Sunday. The 24-year-old — ranked number one in Twenty20s — hit a punishing 58-ball 79, with seven boundaries and two sixes, while Mohammad Hafeez hit a 34-ball 53 not out, with two sixes and four boundaries, to lift Pakistan to 166-3. Spinners Shadab Khan (3-30) and Imad Wasim (2-28) then hastened New Zealand’s slump to 119 all out in 16.5 overs as the Kiwis lost their last eight wickets for just 23 runs. This was Pakistan’s second series whitewash after romping past Australia 3-0 last Sunday. Kane Williamson top-scored for New Zealand with a 38-ball 60, with eight boundaries and two sixes, while opener Glenn Phillips made 26. Babar Azam, when on 48, completed 1,000 runs in Twenty20 internationals in just 26 innings, bettering India’s Virat Kohli’s record of reaching the mark in 27 innings. Azam’s rise has matched Pakistan’s elevation to the world number one ranking in Twenty20 internationals since making his debut against England at Old Trafford in 2016, when Sarfraz Ahmed took charge. Sunday also represented Pakistan’s ninth T20 win in succession this year since losing to Australia at Harare in July. But once both were dismissed in the same Shadab over, the innings fell apart, with only Ish Sodhi reaching double figures. Ross Taylor (seven), Mark Chapman (two) and Tim Seifert (nought) fell in quick succession as debutant birthday boy Waqas Maqsood chipping in with 2-21.